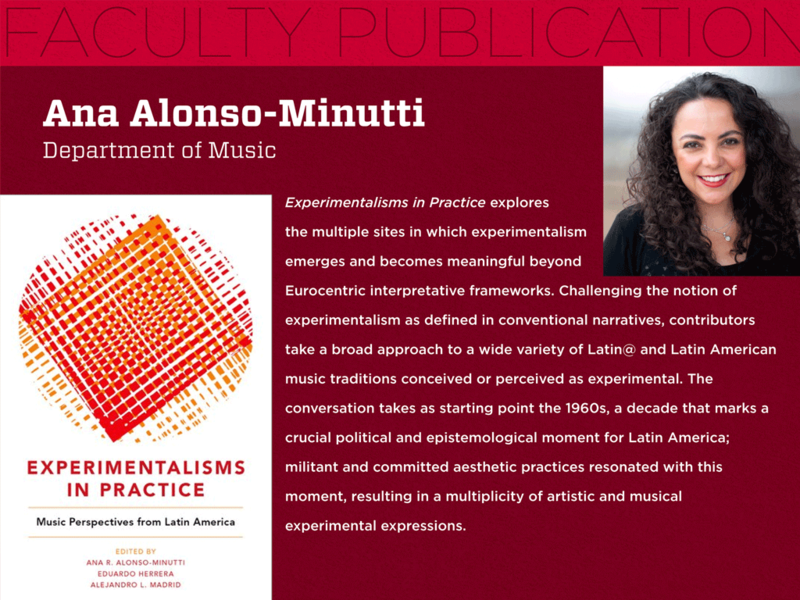 Dr. Ana Alonso-Minutti, Associate Professor in the UNM Department of Music and faculty affiliate of the Latin American & Iberian Institute, has released a collaboratively-authored book, Experimentalisms in Practice: Music Perspectives from Latin America (Oxford University Press, 2018). Co-authored by Dr. Alonso-Minutti alongside colleagues Dr. Eduardo Herrera and Dr. Alejandro L. Madrid, the book offers a glimpse into a variety of previously neglected experimental music scenes in Latin America and among Latin@s in theUnited States; takes a broad approach to a wide variety of Latin@ and Latin American music traditions; challenges the notion of experimentalism, within conventional narratives; and brings the strongest and most innovative voices across Latin American and Experimental music studies into productive conversation. More broadly, Experimentalisms in Practice explores the multiple sites in which experimentalism emerges and becomes meaningful beyond Eurocentric interpretative frameworks. Challenging the notion of experimentalism as defined in conventional narratives, contributors take a broad approach to a wide variety of Latin@ and Latin American music traditions conceived or perceived as experimental. The conversation takes as starting point the 1960s, a decade that marks a crucial political and epistemological moment for Latin America; militant and committed aesthetic practices resonated with this moment, resulting in a multiplicity of artistic and musical experimental expressions. Experimentalisms in Practice responds to recent efforts to reframe and reconceptualize the study of experimental music in terms of epistemological perspective and geographic scope, while also engaging traditional scholarship. This book contributes to the current conversations about music experimentalism while providing new points of entry to further reevaluate the field. Dr. Alonso-Minutti holds a PhD in musicology from the University of California, Davis. Her teaching and research endeavors blend musicological and ethnomusicological inquiry into the study of contemporary musical practices across the Americas. Her scholarship focuses on experimental and avant- garde expressions, music traditions from Mexico and the US- Mexico border, and music history pedagogy. She has published in Latin American Music Review, Revista Argentina de Musicología, Journal of Music History Pedagogy, Pauta, and elsewhere and her book Mario Lavista and Musical Cosmopolitanism in Late Twentieth- Century Mexico is under contract with Oxford University Press. As an extension of her written scholarship she directed and produced the video documentary Cubos y permutaciones: Plástica, música y poesía de vanguardia en México. Prior to joining The University of New Mexico, she was assistant professor of music at the University of North Texas.